An important tool in any contractor or installer toolbox, is the utilization of locating procedures by GPRS. GPRS provides critical information regarding the location of utilities which can be beneficial to the design, installation, and site safety for each jobsite. Additionally, the information GPRS provides can aid in lessening the delays, costly repairs or downtime, and safety risks which occur when utilities are struck. In addition to markings on-site, GPRS can quickly produce GPS maps and CAD drawings from the findings which communicate utility locations to stake holders and assist in planning and preparation. Often times, installations at these events can require ground breaking processes in order to secure tents, supply facilities, or contribute to another event functions. There are often multiple considerations for contractors for the successful completion of installations and facilities of their projects. But in general, these could include the designs and alignments of the areas, practices and procedures required for installations, and methods to increase safety and awareness on site. The utility locating information can be beneficial from where to drive stakes to how to design the layout and more. GPRS utilizes multiple technologies and highly trained Project Managers to perform these on-site locating procedures. Some of the multiple technologies in the Project Managers catalog include the versatile 400 MHz antenna attached to Sir 300/4000 interfaces; RD Utility Locating wand and transmitter boxes; as well as a combination of other locating technologies and procedures. This combination of the right people paired with the right technologies produce valuable information to the client regarding the areas where ground breaking, trenching, and drilling may occur. The on-site scanning and marking process is completed in a timely fashion as results are produced in real time. In other words, results are produced during the scanning process in a safe, time efficient, non-destructive way. 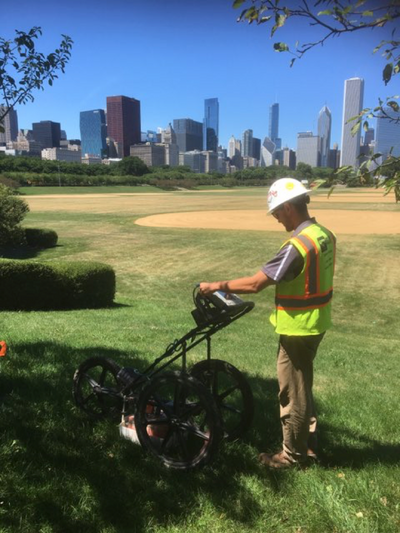 The GPR emits radiation less than 1% of that found to be emitted by standard cell phones, which means practically no hazardous radiation to operators or persons in the work zone. Contractors can feel free to be on site, in communication, and collaborating with GPRS Project Managers during the process. GPRS collaboration with contractors, locating practices, and GPS deliverables can be valuable to the success of design and installation wherever a project may be. With Project Managers locally, and in markets across America, contractors can easily reach out to GPRS to begin the process of a quality utility locate. Reach out to a Project Manager via the new GPRS App, or GPRS can be reached nationwide via contact page. For the Chicagoland area, please feel free to contact the Chicago Office at jeremy.campbell@gprsinc.com, (312) 448-4315, or rmo@gprsinc.com to speak with a Regional Office Manager.